Launched late last year, the 412GW sits below the range-topping 512G model in Nextbase’s line-up. It captures video through a six-element lens with a 140-degree viewing angle at up to Quad HD 1440p at 30fps or 1080p at 60fps. The higher frame rate is useful as it delivers more fluid motion in captured scenes, making it easier to discern what happened in an accident, and the Nextbase offers the highest resolution at this increased frame rate of all the units in our group test. 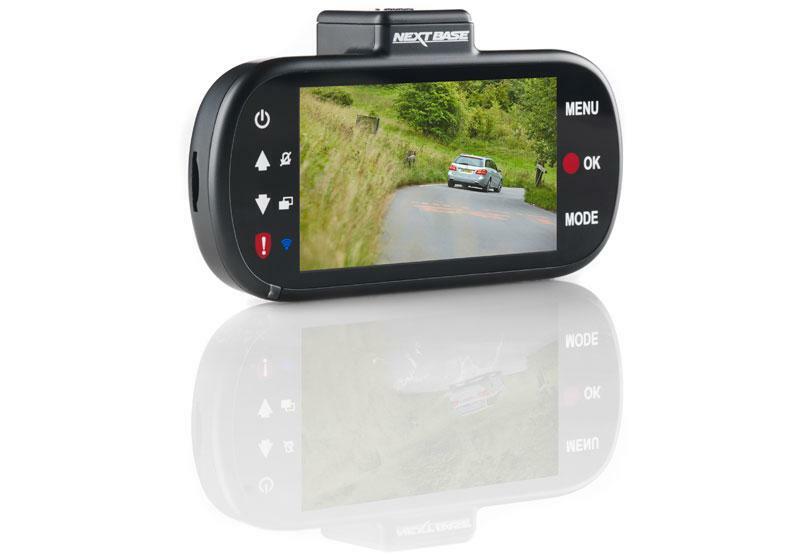 Footage is recorded to an SDHC/SDXC MicroSD card of up to 32GB capacity, while a 3-inch LCD display allows framing, playback and menu navigation in conjunction with the touch-sensitive buttons either side. Although like most dash cams the 412GW is designed to be powered by the vehicle during operation, it does feature a built-in battery that during our testing managed 39 minutes of continuous recording. Thanks to the large battery, the Nextbase offers a useful Parking Mode without the need for it to be permanently hard-wired to the vehicle. If it detects movement through its G-sensor, the 412GW will switch itself on and record a two-minute protected video before returning to standby, although during our testing it required a fairly hefty jolt to activate this. There’s a Protect button on the unit itself to preserve the current recording, and files marked this way or automatically by the G-sensor are moved to a ‘Protected’ folder on the SD card so they’re easy to find. Footage can have a variety of data burned in to it, including the current date and time, GPS co-ordinates, vehicle speed, and even your number plate if you enter one via the settings screen. The unit can also capture stills at 4MP, making it useful to grab quickly at the scene of an accident to record additional evidence. Accessing the recorded footage can be achieved in several ways. The unit has Mini-HDMI and 3.5mm AV ports for direct connection to a TV, plus a Mini-USB port that allows the camera to act as its own card reader through a Mass Storage mode. Or you can simply eject the SD card and copy the files off directly. With the files transferred, perhaps the easiest way to review footage is to use Nextbase’s own Replay software, available for both Mac and Windows. 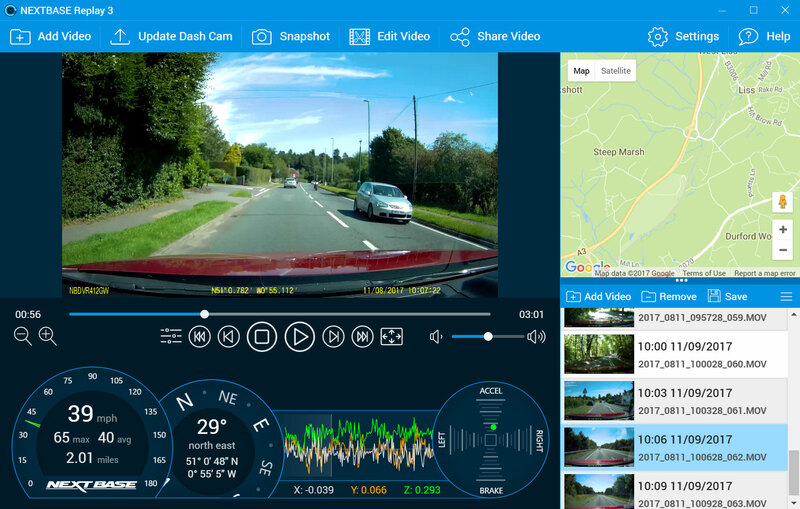 It not only makes it easy to review each video, but also features a read-out of your current speed, location, heading, G-meter and trip information, complete with a constantly-updated fix on your position in Google Maps. The software also allows you to join multiple files together, trim away footage you don’t want included, add annotations and title screens, and share the result to Facebook, Twitter, YouTube and Vimeo. One clever feature we particularly appreciated is that the GPS log data is embedded within the video file itself, whereas the other units we tested relied on a series of separate files that are easily left behind. 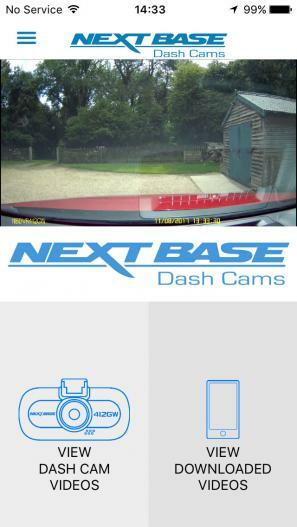 Alternatively, Nextbase’s Cam Viewer app (for iOS and Android) allows you to connect to the camera over Wifi to view video and stills stored on the camera, download them to your phone, and subsequently share them with others. The latter process can be a little fiddly at times as you have to break and re-establish the Wifi connection to achieve it, but that’s hardly unique to Nextbase. During our testing the 412GW performed flawlessly, consistently starting recording as vehicle power was applied, while the quick-release mechanism allows you to leave the suction mount attached to the windscreen but take the camera with you. A decent length cable makes it easy to tuck it behind various trim panels, although as it terminates in a cigarette lighter adaptor you can’t use a USB port should your vehicle provide one. Image quality was quite decent, although we felt at times it was perhaps a little soft, with number plates largely unreadable if more than a car’s length away. There was also blooming in evidence around other vehicle’s brake and running lights that led to a slightly out-of-focus feeling to much of the footage. At night, the 412GW exhibited perhaps a slightly narrower dynamic range than some of the other cameras on test, but it was able to extract a surprisingly usable picture, even in near pitch-black conditions without vehicle headlights. We did notice, however, there was occasionally obvious internal refraction leading to lens flare from headlights, while the tail- and brake-lights of preceding vehicles were repeated elsewhere in the frame. One final comment is that the internal mic seemed rather muffled in comparison to the other units. Not that we’re particularly keen to capture swearing in high-fidelity in the event of a collision, but the audio captured by the other cameras was substantially clearer. Where the Nextbase scores highly over the other units is in its provision of a large display for framing and review, its ability to record 1080p at 60fps, the excellent Replay application, its sturdy yet quick-release mount, and the support from Nextbase itself, particularly with regard to regular firmware updates with new features.